Although we are already into June, it still feels to me that the fly fishing season has just begun. It was not too long ago that I took my gear out of the basement for the first time in months and smelled the scent of the river rising from my vest and waders. It is a distinctive smell, a scent of water and plants and nature, one that never fully leaves your gear during the off-season. It is said that smell is one of the five senses that is very connected to memory. We remember a place in our mind’s eye, or recall a song from the distant past. Yet it is a smell from our past that can instantly bring us back to that distant place. It may well be that moment of smelling the river on your fly fishing gear begins the fly fishing season in earnest. There is much to do to prepare for the first trip out to the stream. Fly rods, reels and fly lines are taken out and examined. Waders are checked for leaks and repaired. Tippets and leaders are counted. Flies are surveyed. A list is made of necessities to be purchased for the upcoming year. Accounting for all of your fishing gear after a long winter is a time honored tradition of fly fishing. 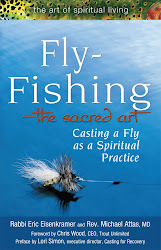 Judaism also teaches that we are to perform a yearly accounting, not of fly fishing gear, but rather of our souls. Just as fly fishers inspect their gear at the beginning of the season, Jews perform a soul-searching at the beginning of the Jewish New Year, Rosh Hashanah. In Hebrew, this process of soul-searching is called chesbon nefesh, which literally means an accounting of the soul. We are to reflect on our deeds in the year that is ending, both good and bad. We are to examine all aspects of our lives, professional and personal. Focusing on our shortfalls, we are to search for areas of improvement in the year to come. Surveying fly fishing gear helps us prepare for the fishing season and ensure that we have everything we need for a trip to the stream. Chesbon Nefesh, Jewish soul-searching, helps Jews to prepare for the year to come and to begin the process of repentance and repair. Another time honored tradition at the beginning of the fly fishing season is the first trip to the fly shop. I love all fly fishing stores, the big chains and the small independent stores. There is something special about visiting the local shop that somehow stays in business year after year, with every square inch of shelf-space covered in leaders and tippet spools and the drawers filled with an endless array of dry flies, nymphs and streamers. At the independent fly fishing store you sit and talk to the owner, ask about business (usually hearing in response “we’re getting by,”) and gather info on the local streams. Let’s admit the truth: the fly fishing store is like a toy store for adults. As children, we all remember trips to the local toy store and the shelves filled with baseball cards, action figures and brightly colored games and puzzles. Standing before an open drawer filled with countless flies, we recapture some of that same joy and excitement. We examine each fly, thinking that perhaps this red/gray Adams will bring that large brown trout to the surface, or a brown copper John nymph will prove irresistible in the fast currents. Fly fishing is fun, an activity we do when we are not at work or taking care of other responsibilities in our lives. Stocking up on flies, surveying your gear and catching the scent of the river, these are all traditions of the Spring and the beginning of another glorious year of wading into the stream and casting a fly. Great description of what we feel getting ready to hit the stream!